The time has come for evangelical Christians to rethink their faith. Many of us grew up with a Christianity centered mostly on the teachings of Paul. If our churches studied a Gospel text it was almost invariably the Gospel of John. We may know much about being saved by faith, about the troubling issues within the Pauline churches, and about being born again, but have we explored the life and teachings of Jesus as portrayed in the Synoptic Gospels? • What was the message and ministry of Jesus really about? • How should disciples of Jesus Christ relate to people of other religious faiths? • What are the dynamics of an authentic faith? What are the dynamics of grace and forgiveness? • What’s involved in living in God’s new world? • Must Jesus literally return to this earth? Chuck Queen is pastor of Immanuel Baptist Church in Frankfort, Kentucky. He has degrees from Grace Theological Seminary and the Southern Baptist Theological Seminary. Chuck’s passion is teaching lay people in the spiritual art and craft of theological reflection and biblical interpretation. He and his wife, Melissa, have three children: a married daughter who is an elementary school teacher, an adult daughter who lives at home and is very engaged in Special Olympics, and a son, a high school senior, who loves baseball. He can be reached at cqueen@fewpb.net. 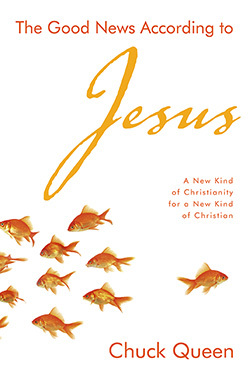 In The Good News According to Jesus: A New Kind of Christianity for a New Kind of Christian, Chuck Queen has given us a book that lives up to the promise of its title. I had planned to “skim” this book but found myself completely immersed in it. Queen has delivered a thoughtful, intelligent, and scholarly—yet imminently readable—examination of what it can mean, what it can look like, and yes, what it can feel like, to be a Christian in today’s world. 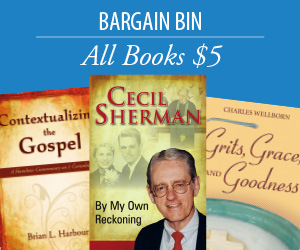 He begins with the Bible, of course, then reaches out to other writers, philosophers, scholars, theologians, and just plain Christians to hone what can well be called a handbook of Christian understanding and action. I’ll go back to this book again and again. If you’ve never wrestled with your faith, welcome Chuck Queen, who offers a candid perspective too often neglected by preachers wanting to play it safe. If you have struggled with sincere questions, you will discover a fellow pilgrim who is willing to trust you and invite you into the conversation. Either way, you’ll find a caring and honest pastor helping you find Jesus’ life-giving good news.